Consider the “hydrology” of a river bend. Water flowing on the outside of the curve, because of centrifugal forces, will move faster than the water flowing on the inside of the curve. As gold continues to be transported down river, the gold that is farthest to the outside of a curve will be carried around the curve. That gold that is closest to the inside of a curve will tend to drop when the water loses velocity at the beginning of the curve. This is frequently a good spot to look for gold. As stated earlier, gold is the heaviest of the materials in a river and combined with the agitation of all of the materials in the river at flood stage, will accumulate not only at stream bed bottom but will ultimately work its way below bed level until it encounters bedrock–the actual bottom of the valley itself. The bedrock may be shallow beneath the stream bed, and have very little “overburden” on it (or even be exposed), or it may be deep (30 or 40 feet or more under the overburden). Since gold will tend to rest and penetrate to bedrock, you must be able to reach bedrock where you are dredging. Keeping all of the previous criteria in mind, look for an area that has bedrock shallow enough for you to work down to it. A clue to the depth of bedrock can be seen on the banks of the river. Exposed bedrock on the banks will indicate that bedrock is shallow. Exactly how shallow will not be known until you actually begin dredging. Sharp drops in the bedrock on the banks may indicate a continuation of that steep drop underwater, meaning the river bottom may be quite deep. A gradual drop in bedrock at the banks means just the opposite. That bedrock is probably fairly shallow. Remember that these are “Rules of Thumb” and not necessarily predictive in all cases. If no exposed bedrock can be seen in the river or on the banks, look up on the sides of the canyon. Look for an outcropping of rock on both sides directly opposite of each other and draw an imaginary line from one outcropping down to the river and then up to the opposite outcropping. As noted earlier, where this line crosses the river is a pretty good indication of where the bedrock will be the shallowest. The bedrock at the bottom of the river is not the only place you will find gold, however. When the bedrock is deep, there will be clay layers that form below river bed, down to bedrock. When compacted, these clay layers can act as a “false bedrock.” That is, unless flood turbulence is sufficient to churn up the entire river bottom all the way to bedrock, then the material in the first few layers may be all that moves. The gold may be heavier than the material in the clay layer, but unless that material is agitated, the gold can’t penetrate it. So, the gold will be sitting on the clay layer, or may only penetrate it as far as the overburden agitation can press the gold into it. As a rule of thumb, gold will be in about the top 6 inches of a clay layer. If you dredge beyond this top 6 inches, be prepared to go to the top of the next clay layer (or bedrock, whichever you reach first). Clay layers will vary in thickness from a few inches to several feet thick so excavating down to the next clay layer can be quite time consuming. Any dredging excavation must be expanded laterally as one goes deeper so as to make removing boulders easier and working in the hole safer (avoiding cave ins). When working in an area that you know will have clay layers, consider each clay layer as “bedrock” and work it like you would actual bedrock. Once you reach it, work laterally (to the right and left) until you reach the outer edges of the pay streak. Once the sides of the pay streak are found, you must decide whether to continue on this layer or dredge down to the next layer. But, when making your decision, remember that just because there is a pay streak on this clay layer does not mean there will be a pay streak underneath it on the next clay layer. There may be a pay streak on that next clay layer directly underneath the pay streak of the clay layer you are working, but it may be located to the left or right , or may not be present at all. Working clay layers can produce good gold, but the best gold will be at bedrock. Try to work areas where you will be able to reach bedrock immediately, or at least soon after penetrating one or two clay layers above bedrock. We have already determined that the inside of curves are good place to look for gold. Both the point where the inside of the curve starts, and the fan or “pay streak” following the curve will both have good potential. This is because the speed of the water at the inside of a curve is less than the “mean water speed.” We also know that the speed of the water on the outside of the curve is greater than the mean water speed. 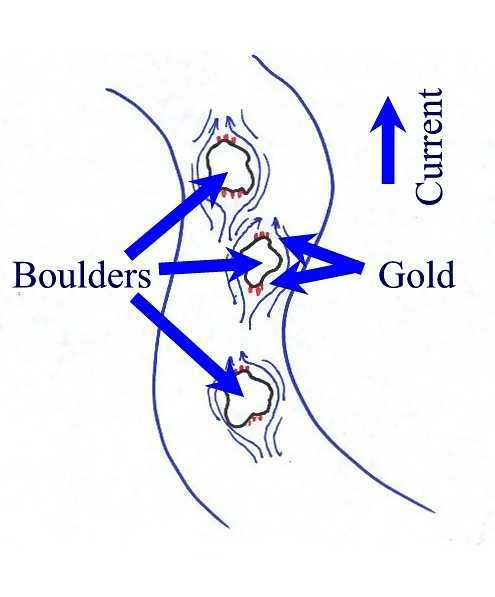 So, no gold (generally) will be found on the outside of the curve, as the force of the water there will push it around and out of the curve. What other conditions can cause water speed to decrease? Any large object in the water will have water eddying or “curving” around it. And, just like in a large bend of the river, the water that “curves” around an object will lose velocity and will drop carried gold at the beginning and ending portions of those curves. Consider a large boulder sitting in the river. Water flows around the boulder. The water “curves” around the boulder on both sides. If you look closely at the center of the upriver side of the boulder, you will see that the water is almost stopped. That is a place that gold may pocket (at the center of the upriver side of the boulder). If you watch the water as it curves around both sides, you also see a location where the water again almost comes to a stop, and that is the center of the down river side of the boulder. This is also a good location for gold deposition, and is generally better than the up river pocket.